Below, we have provided more detailed information about each campaign that Kersey Valley Spookywoods sent out to their growing subscriber list, as well as the response rate to each message. If you observe closely, you will notice that the subscriber list experiences drastic growth and the offers sell out in less time with each new campaign. 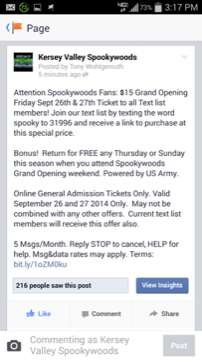 On 9/24/14, Spookywoods launched a campaign for growth targeting Facebook users and their VIP text list. Customers were given an exclusive pricing incentive for the grand opening, and invited to text SPOOKY to 31996 to receive this offer and become a Spookywoods VIP. After the list had grown, Spookywoods then sent out the exclusive pricing information to the new members. Upon the campaign’s release on 9/22/14 at 11:06 AM to 3,304 active subscribers, Spookywoods sold 94 tickets before the offer was pulled. You will notice a trend as you continue reading. Spookywoods tweaks the release time and type of offer over the next few promotions and response increases drastically. This response increase can also be credited to the proximity of Halloween. On 10/17/14, Spookywoods sent another message to 4,419 subscribers. The campaign followed SlickText’s proven guideline for response and used a scarcity tactic to encourage instant action. The following campaign was limited to the first 200 buyers and provided a link to Eventbrite to purchase tickets. Upon the campaign’s release on 10/16/14 at 3:12 PM EST, ticket sales instantly spiked. In the first 10 minutes, Spookywoods sold 150 tickets, and within the following 15 minutes, reached the limit of 200 at the exclusive rate. On 10/26/14, a message was sent to the current subscriber list of 4,993, allowing a limited amount of VIP subscribers to take advantage of an exclusive offer for $20 OFF VIP passes or Immediate Access passes to the first 100 VIP’s to purchase. Upon the campaign’s release on 10/26/14 at 5:27 PM EST, the offer SOLD OUT within 8 Minutes. On 10/30/14, a message was sent to the current subscriber list of 5,173 active subscribers offering a limited amount of Immediate Access passes to the first 100 VIP’s to purchase online for $20 OFF the list price. Upon the campaign’s release on 10/30/14 at 5:14 PM EST, the offer SOLD OUT within 3 Minutes. On 10/31/14, a campaign was sent to the current subscriber list of 5,153 on Halloween night, offering a limited amount of Immediate Access passes to the first 100 VIP’s to purchase online for $20 OFF the list price. Upon the campaign’s release on 10/31/14 at 4:01 PM EST, the offer SOLD OUT within 10 minutes. If you’re interested in getting the ball rolling with your own sms marketing campaign, get in touch with us. We can develop a specific strategy based on your business. Contact the sms marketing professionals from SlickText.com today at 1-800-688-6290.